Mix your flour and sugar in a bowl, and set it aside. In another bowl, mix your buttermilk, egg and oil and then add that to the flour, baking soda and sugar. Mix everything up until the lumps disappear. Using a cup from a measuring kit, measure out 1/4 cup of batter for each pancake into a hot, lightly buttered skillet. Cook each pancake until the top is covered with bubbles and is able to be flipped over without breaking. 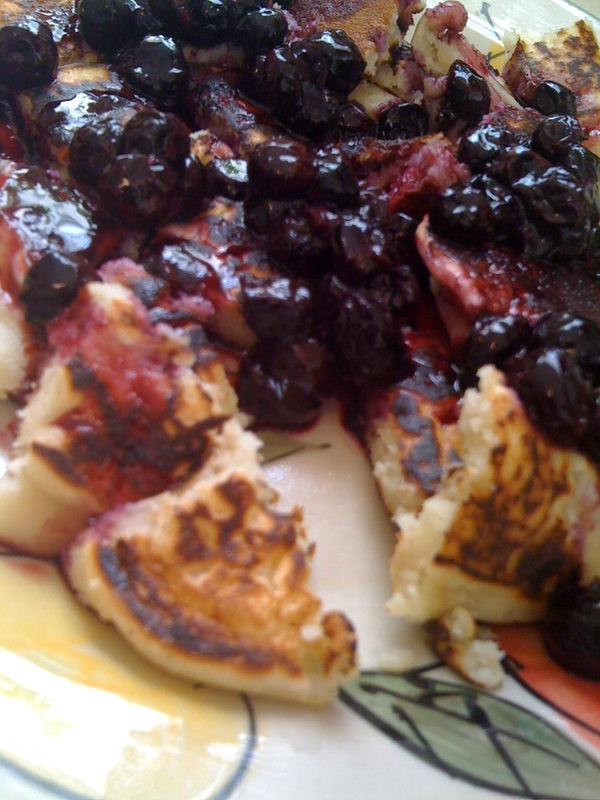 For a more updated guide to making delicious pancakes from scratch, check out this entry into The Breakfast Club! What Does YOUR College/Alma Mater Do to Help You Get and Stay Fit? These look wonderful! How’d you make the blueberry topping? Erika these were very good! My 17 month old loved them. I plan on trying these. I LOVE pancakes and always used mixes. Great recipe! Now my issue is and always has been portion control. How many of these can a girl have? And if I am counting calories, how many cals are these? Thanks! Thanks for this recipe! I’d always been too intimidated to attempt making pancakes, but your recipe was very easy to replicate. The texture of the pancakes was fabulous and they went especially well with a strawberry spread I made using your jams/jellies recipe. I really want to try this recipe with different fruit spreads in the future! To those who are curious how many pancakes this recipe makes: I made a triple batch that created 27 pancakes, for an average of 9 pancakes made using Erika’s recipe. The cooked pancakes were about the same size as frozen pancakes you may buy at a store, but the quality and taste are (of course) far superior to frozen pancakes. I don’t know how many pancakes go into a single serving, but I served these for brunch and most people were full after eating 4 pancakes, 2 eggs, and 2 slices of bacon. I would say 3-4 pancakes would fill one up if they were eating a traditional breakfast. Swapping out the flour in recipes is…. it’s risky. Because of the change in the protein and gluten content when you switch from whole wheat to something else, you could wind up with some really inedible pancakes, LOL. Your best bet would be to hit up your old friend, Google. If it’s one thing I learned the hard way, it’s that switching up flours like that can quickly result in a waste of time AND money.